I'm so happy to be sharing this finished quilt. 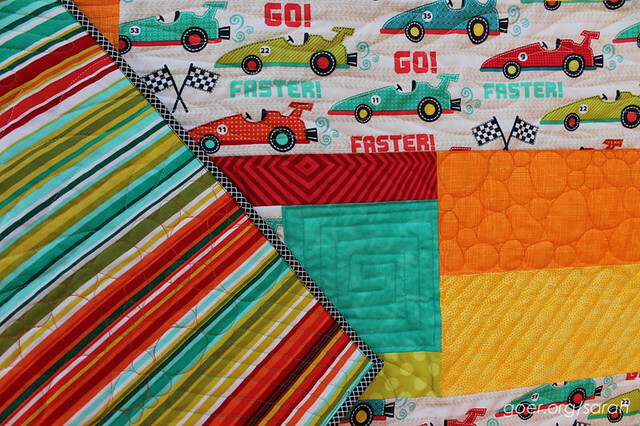 I bought the race car fabric quite a while ago and hadn't found a reason to use it until recently. 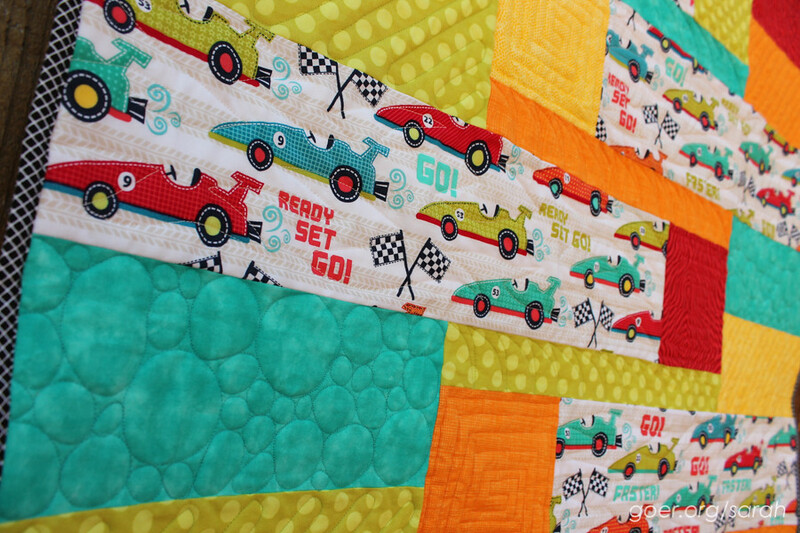 I designed this quilt to feature the race cars without chopping them up to small. There are a fair number of partial seams, but I already mastered those while making my Purple Ninja quilt. 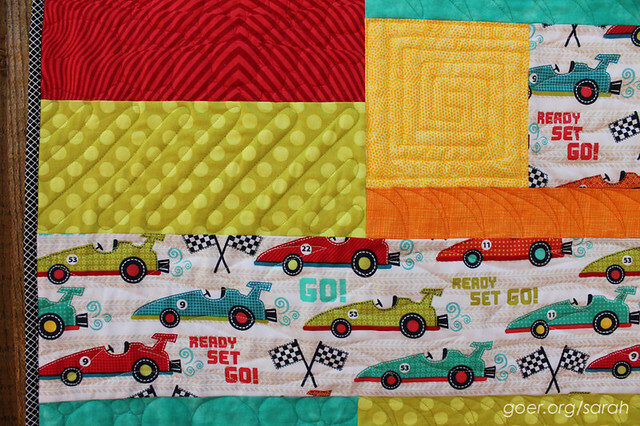 I love bright colors and enjoyed pulling together the blender fabrics to accompany the race cars. I ordered the Ta Dot print in Apple and Crosshatch Sketch in Tangerine since I didn't have the right green or orange in my stash. So five of my seven fabrics are from my stash. 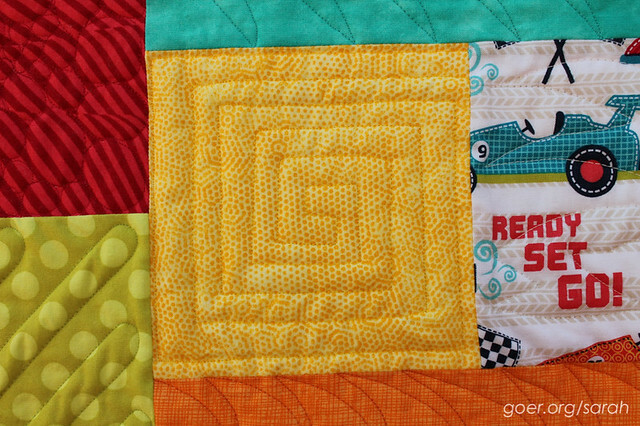 Each section is quilted in matching Aurifil thread (Red #2250, Burnt Orange #1133, Canary #2120, Spring Green #1231, Turquoise #2810). I chose to use the same motif in each matching section of the layout, and I wanted a variety of curves and lines. The cars each have a freeform, flamelike pattern (in Natural White #2021). The square sections each have a square spiral. 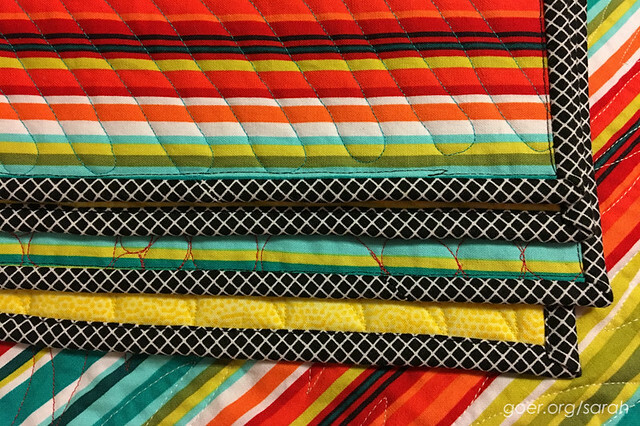 I used large pebbles (I like to think of them as river rocks) in the top of each pair of rectangles and switchback quilting on the diagonal in the lower rectangle. 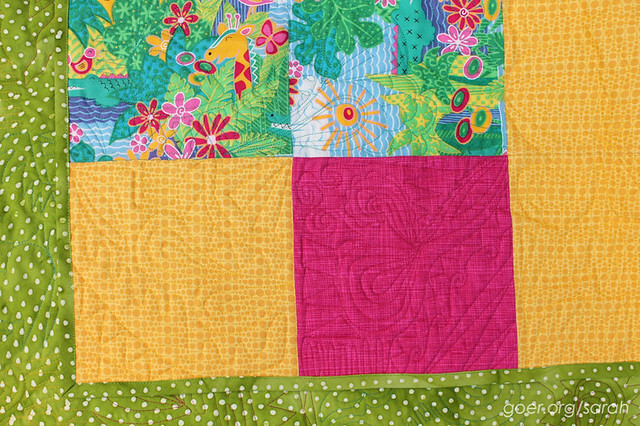 The long, skinny rectangles were each quilted with a curvy zigzag that ended up looking like shark fins to me. 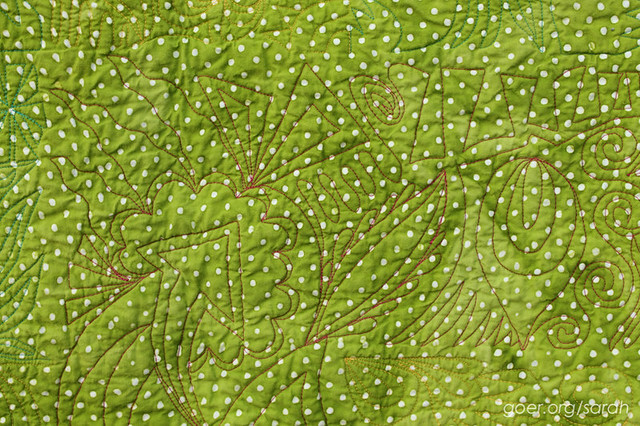 It's been a while since I've done much free motion quilting, so it was fun to get back in the groove. It's so much more fun than quilting a bunch of parallel straight lines (that quilt will be done soon so I can share it!). 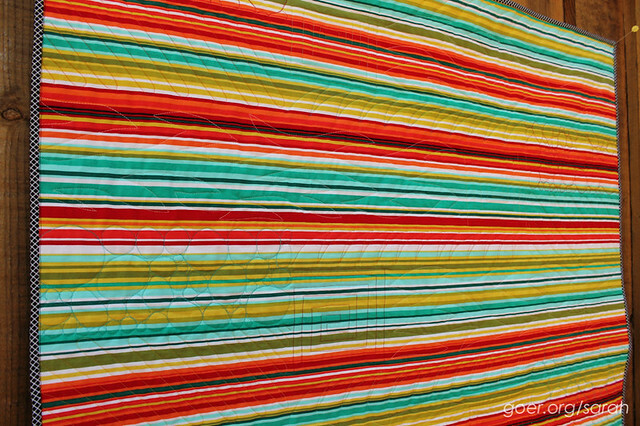 I had a great stripe in my stash that I chose for the backing, which drove the size of the quilt. It finished at 34" x 40". I think it's a great baby quilt size, even though this one will be going to a 4-year-old. It's still a great size for cuddling up with at that age. Certainly big enough to cover himself on the couch for reading or TV watching. Since the quilt was full of color and the backing was, um... loud, I decided to bind it in a black and white. It's the first time that I have made a straight grain binding which I found a little more picky to work with, but I wanted to keep the crosshatch pattern on the binding on the diagonal. 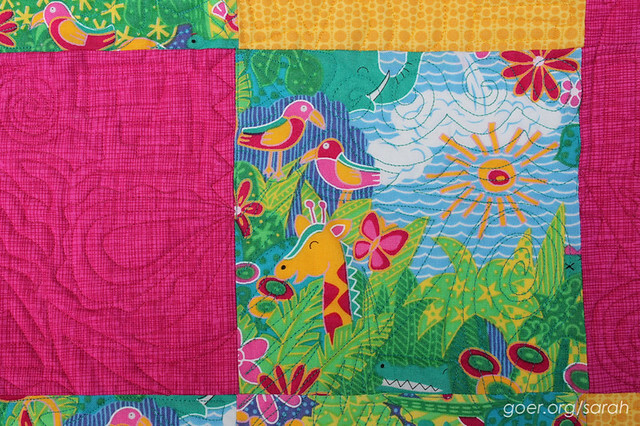 What do you like best about making quilts for kids? I'm linking up to Finish It Friday, TGIFF and Needle and Thread Thursday, as well as the Q3 Finish Along finishes party. See all my Q3 WIPs in my goal post. Posted in Quilting. 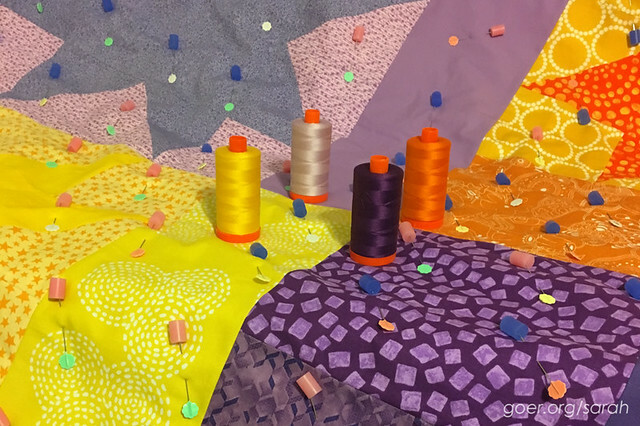 Tags: baby quilt, finished quilt, free motion quilting, sewmystash, sewmystash2016, Zoom Zoom on September 29, 2016 by sarah. I've basically been a free motion quilting machine this week. 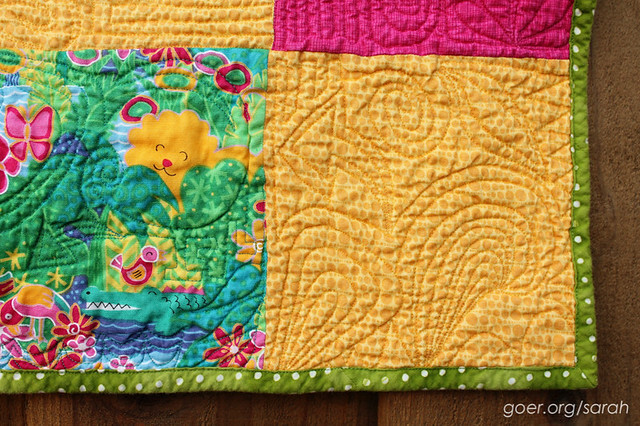 Last week, I'd just started the quilting on Zoom Zoom. It's now fully quilted and bound! Woo hoo! Full reveal on the blog tomorrow, but here's a peek. 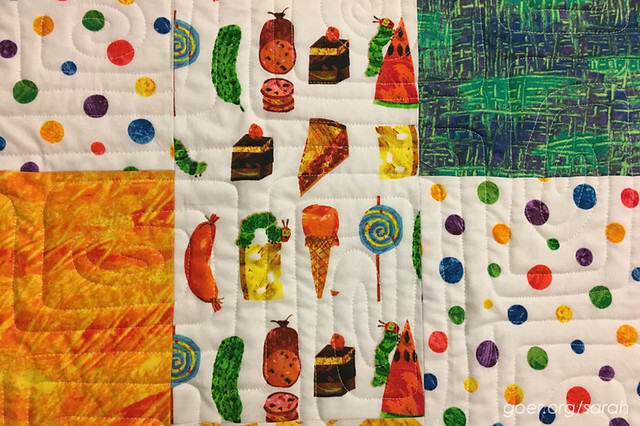 I also completed the quilting on Caterpillar Fizz, my baby size Very Hungry Caterpillar quilt. No binding yet. 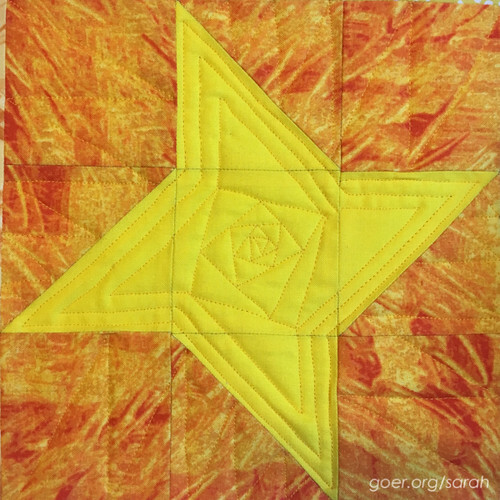 Then I moved on to my Star Light Star Dark quilt from the quilt along at Quilty Habit. I'm quilting each quadrant with a different color thread, and I'm almost done with the yellow thread section. I just need to quilt the large star. 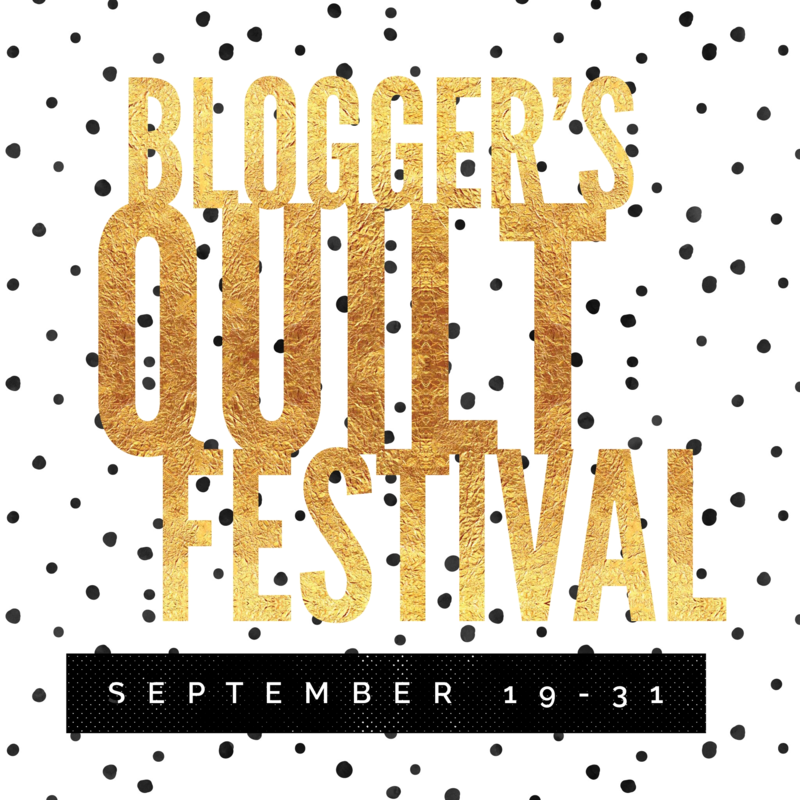 In case you haven't seen my last two posts, I've entered quilts into the Original Design and Home Machine Quilted categories of the Blogger's Quilt Festival. 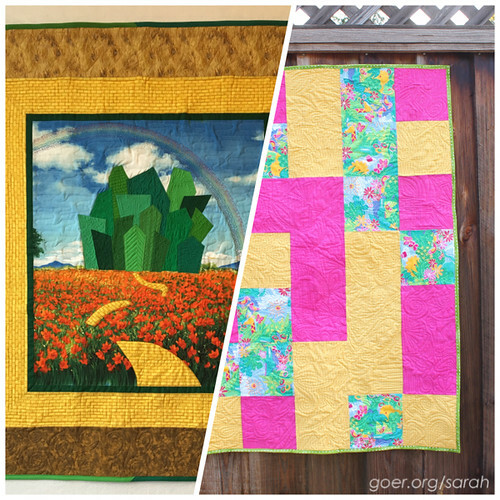 Voting is open through Friday if you'd like to check out the many beautiful quilts being shared and vote for your favorites. There are links to the categories I entered in my last two posts and you can find all the categories on Amy's main post. Thanks for visiting! I hope you're having a great week. I'm linking up to Midweek Makers and Needle and Thread Thursday. Posted in Quilting. 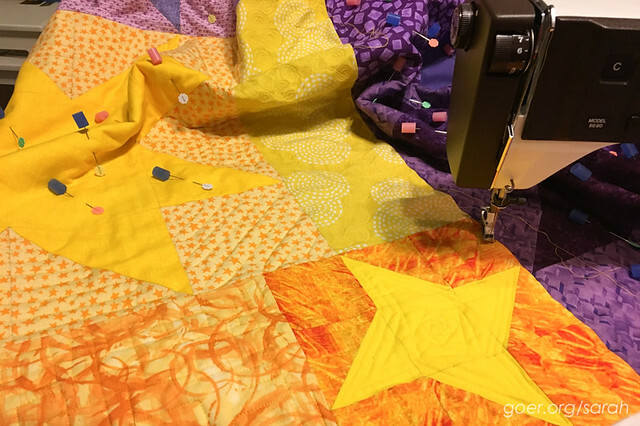 Tags: baby quilts, Caterpillar Fizz, free motion quilting, Star Light Star Dark, Zoom Zoom on September 28, 2016 by sarah. 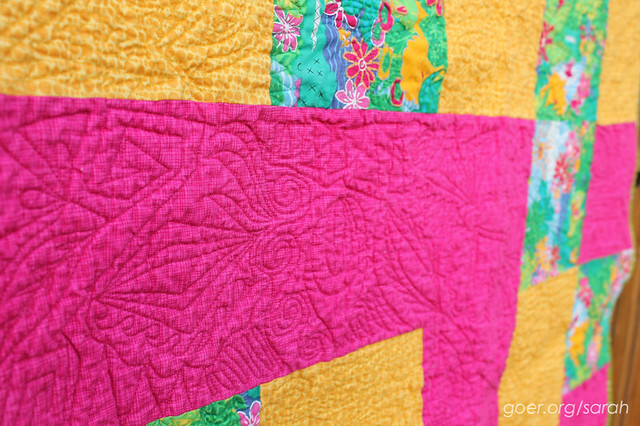 For my second entry into this year's Blogger's Quilt Festival, I've chosen R's Pattern for the Home Machine Quilted (<--voting open through Friday!) category. Welcome to anyone visiting for the first time! 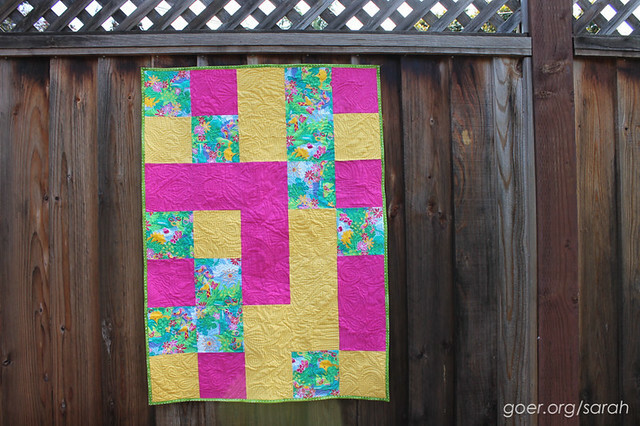 This quilt design was done by my then 2 1/2 year old daughter and I enjoyed playing with it in the quilting process. This is the largest quilt that I've quilted with graffiti quilting. 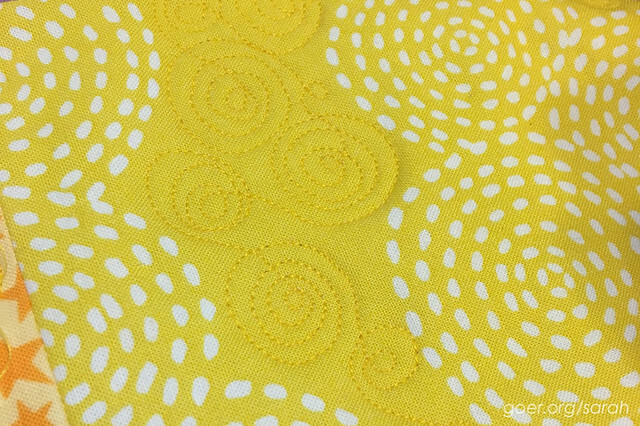 I chose to match thread colors to the front fabric. 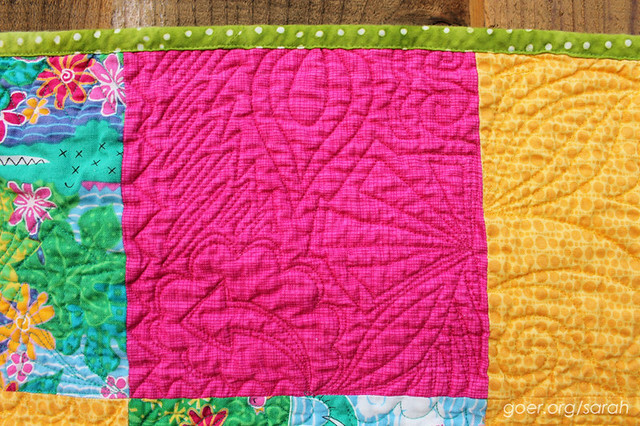 I've taken some new crinkly pictures of the quilt after it's been washed. 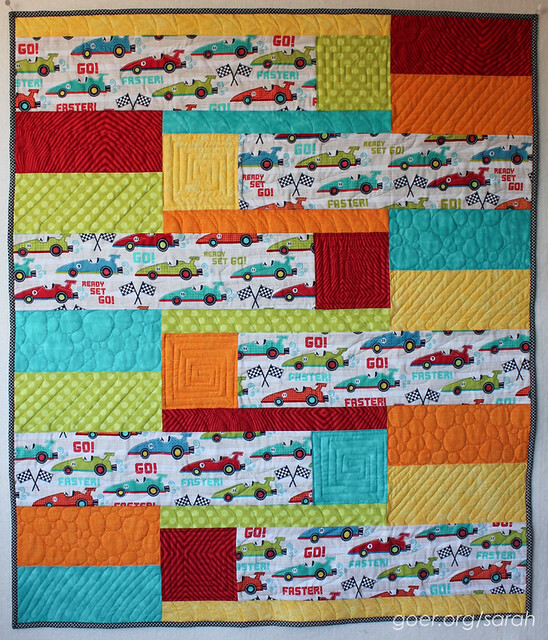 I think this shows off the quilting even better. 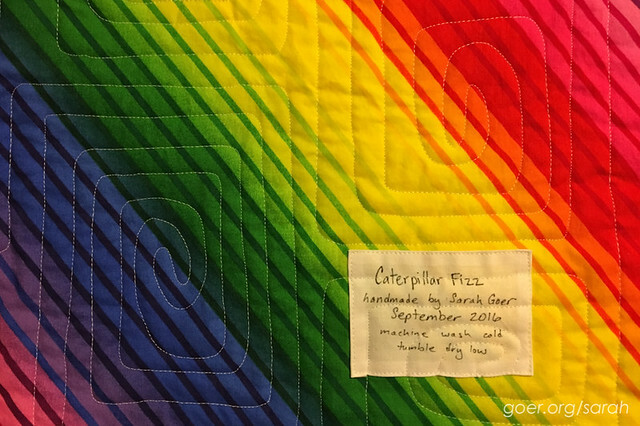 You can view the rest of the quilts in the Home Machine Quilted category and starting soon you can vote on your favorites. There is so much amazing work being shown through the festival. 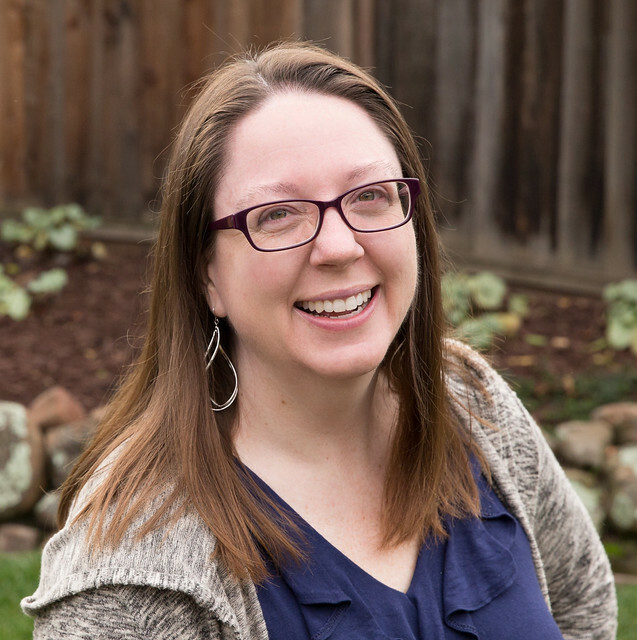 Please visit Amy's Creative Side which has links to all the categories. Posted in Quilting. 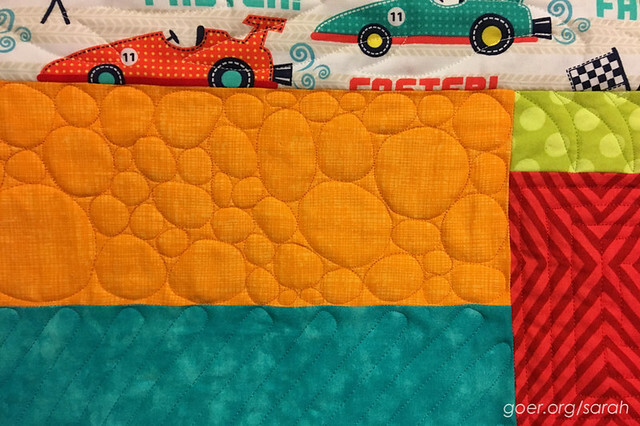 Tags: baby quilt, free motion quilting on September 25, 2016 by sarah.